Charles Hendricks started the hope & grace label with two vineyards in 2004. After a decade, those two beautiful wines remain the flagship of our wine collection. 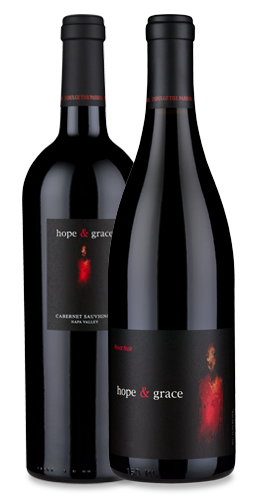 The hope & grace gift includes one bottle of our 2015 hope & grace Pinot Noir, Santa Lucia Highlands and one bottle of our 2014 hope & grace Cabernet Sauvignon, St. Helena, Napa Valley, beautifully wrapped and hand-picked by our team.